The wines from Puck's debut collection have been aged since 2009 and are produced by California's Delicato Family Vineyards, a three-time US Wine Producer of the Year award winner at the International Wine and Spirits Competition. This first collection includes four varieties: Cabernet Sauvignon, Chardonnay, Merlot, and Sauvignon Blanc. Each bottle is priced between $30 and $35 and is currently available at Wolfgang Puck restaurants. Affordability was a big factor to consider for Puck while planning price points. "Everyone should be able to have good wine at an affordable price," Puck said. "Wine completes any meal and sets the mood." 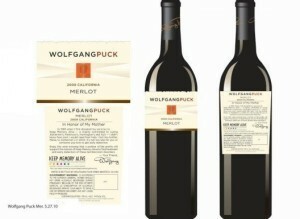 Each bottle of Wolfgang Puck Wines sold will also raise money for a good cause, one that has affected Puck personally. The wine labels display "In Honor Of My Mother" on the back. It is a tribute to his mother, Maria, whose death in 2004 from Alzheimer’s disease further inspired Puck to become more involved in one of his favorite charities. Fifty cents from each sale will go to the Keep Memory Alive Association, a non-profit organization that raises funds for Alzheimer’s, Parkinson’s, Huntington’s, ALS, and other neurocognitive diseases. The organization has raised close to $100 million since its founding.